July 2015: Tips, eNews and More! 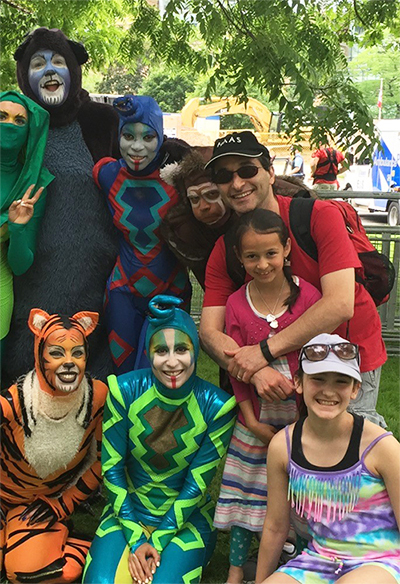 Dr. Dan and his family have been enjoying the summer a lot by keeping busy and making the best of the great weather. 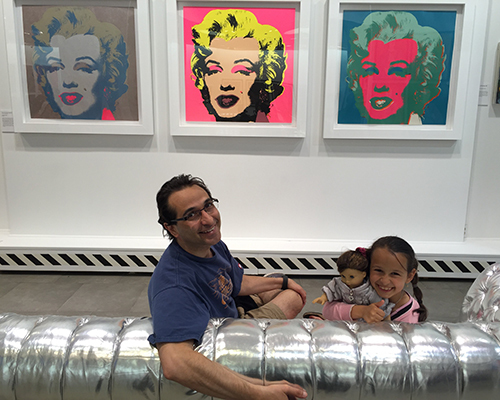 They have been finding the time to hang out downtown and see the many great things our city has to offer like the Andy Warhol exhibit at the Revolver Gallery. So far the highlight of the summer for Dr. Dan and his wife Daneal was when their girls were away for two weeks at a sleepover camp. They did miss Yael and Limona but being kids-free was a treat. 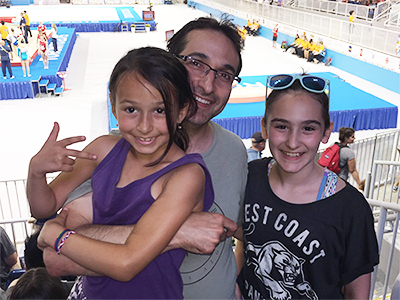 During the Pan Am Games Dr. Dan's family got to see the men's and women's Trampoline Gymnastics competition which Yael and Limona found fascinating. They also got to catch some indoor volleyball. Other than the competitions, they also enjoyed the incredible buzz and atmosphere at the Pan Am Park at the CNE as well as at the Serena Ryder concert at Nathan Philips Square. 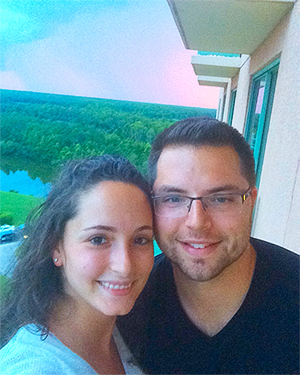 Liat and her husband Yossi recently took a trip to Orlando, Florida where they enjoyed the pool, the sights and Universal Studios. 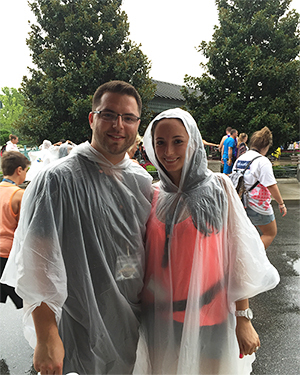 Although it was raining on the day they went to Universal Studios, they still made the most of it and had fun acting like kids. Antonella and her family have been enjoying their summer. Even though Isabella and Adriano are attending summer school, they are having fun. 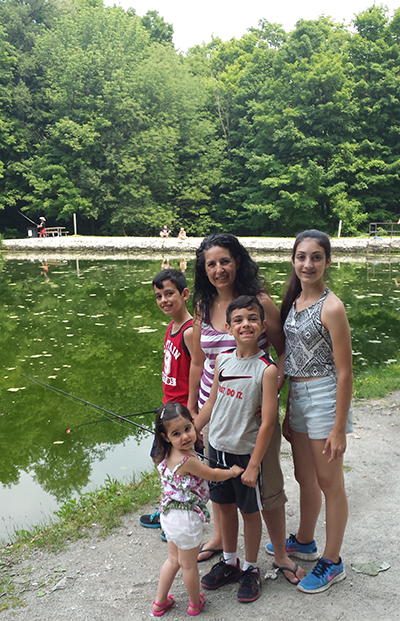 Isabella, Adriano, Andrew, and Gabriella had the opportunity to experience their first fishing adventure. Although they did not catch any fish, Adriano and Andrew did very well casting their lines and attaching the worms on their hook. 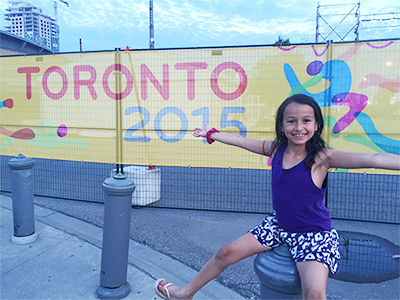 With the Pan Am games in Toronto they did not attend any events, however they were able to enjoy the music and atmosphere at Nathan Philips Square and of course have a photo taken by the Toronto sign. 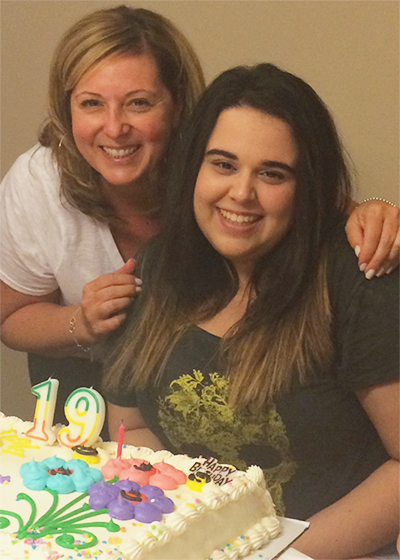 Diana's niece Taleen turned the legal age of 19 this past month! They celebrated with family, having dinner and cake. 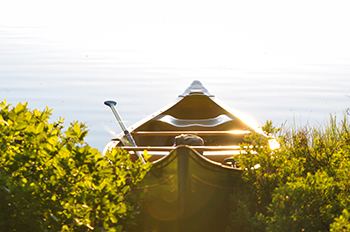 This summer Diana has plans to spend some time at the cottage and relax in the sun. Celia and her family have been loving this wonderful summer weather. They spend most of their time outdoors and enjoy having family and friends over for barbeque. 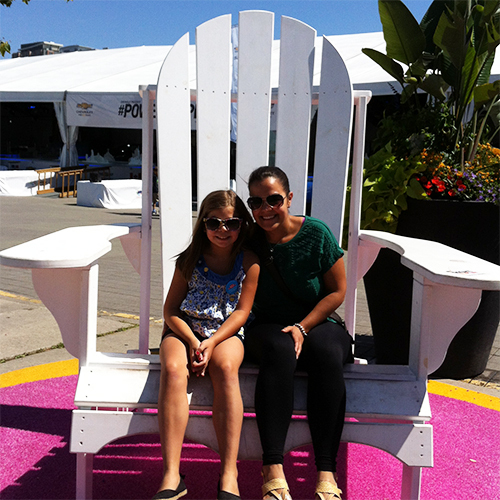 Celia and her daughter Monica got into the Pan Am games spirit and went down to Pan Am Park at the Exhibition grounds where they saw a wonderful performance by some local breakdancers. Monica was fascinated by the strength and moves on these guys. Nicole has been having a great summer so far. At the end of June she travelled back home to Nova Scotia for her 10 year high school reunion. She had a wonderful time catching up with all of her friends. 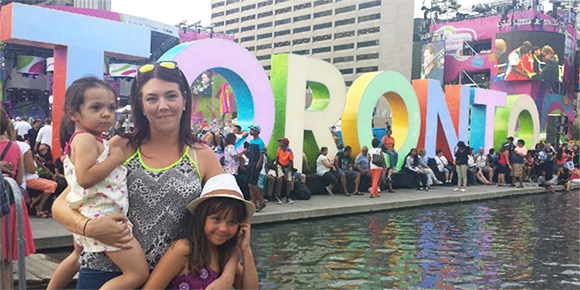 Nicole and family have been enjoying their days off by taking spontaneous road trips and exploring the city. 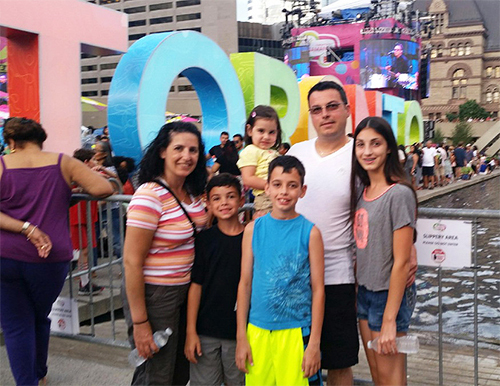 This past weekend they went to Nathan Phillips Square to see the famous TORONTO sign and watch the fireworks. Summer is in full swing and if you have kids at home, they are more than likely getting up later in the morning. It's easy to just give them a sugary bowl of cereal and get on with the day, but that is not doing them any favours when it comes to oral and overall health. Try to provide fresh seasonal fruit for kids and food like eggs which makes a great snack and is a good source of protein without the sugars contained in so many breakfast meals. Be careful about sugary soft drinks. Hot summer months and enticing cola commercials can cause kids to beg you for soda. Try to resist and encourage drinking ice water with a lemon slice or even an orange slice to sweeten the deal. Soda is the worst nightmare for your child's dental health. Do your best to keep it out of the house. Click here for more summertime dental tips! When it's hot outside and you're looking to quench your thirst, water is the best thing for you! 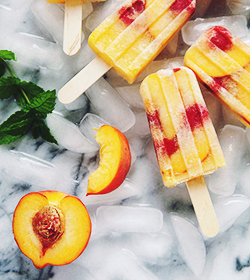 However, we know the heat can sometimes make you crave sweets and in the heat, a refreshing sugary fruit juice is hard to resist, so why not try our Frozen Fruit Pop recipe instead? They are much healthier than many concentrated fruit juices you find in the grocery store and, because it's frozen, it'll cool you down and take longer to finish which means you are less likely to overindulge. Try our recipe, or use your favourite fruits.